The Kwakiutl (kwakwaka'wakw) continue the practice of potlatch. 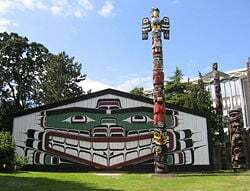 Illustrated here is Wawadit'la in Thunderbird Park, Victoria, British Columbia, (aka Mungo Martin House) a Kwakwaka'wakw "big house" built by Chief Mungo Martin in 1953. Very wealthy, prominent hosts would have a longhouse specifically for potlatching and for housing guests. The ceremonial feast called a potlatch, practiced among a diverse group of Northwest Coast Indians as an integral part of indigenous culture, had numerous social implications. The Kwakiutl, of the Canadian Pacific Northwest, are the main group that still practices the potlatch custom. Although there were variants in the external form of the ceremony as conducted by each tribe, the general form was that of a feast in which gifts were distributed. The size of the gathering reflected the social status of the host, and the nature of the gifts given depended on the status of the recipients. Potlatches were generally held to commemorate significant events in the life of the host, such as marriage, birth of a child, death, or the assumption of a new social position. Potlatches could also be conducted for apparently trivial reasons, because the true reason was to validate the host's social status. Such ceremonies, while reduced to external materialistic form in Western society, are important in maintaining stable social relationships as well as celebrating significant life events. Fortunately, through studies by anthropologists, the understanding and practice of such customs has not been lost. The name Potlatch is derived from Chinook Jargon, a homonym having nothing to do with "pot" or "latch." The homonym comes from Coast Salish Lushootseed potlatching, spelled xwsalikw, from xwɐš, meaning to "throw, broadcast, distribute goods," related to pús(u), "throw through the air, throw at," relating to the giving of gifts and food at such ceremonies. Even though there are variant names between each of the practicing tribes, the ceremony itself is actually quite uniformly practiced. The English term "potluck" is erroneously said to derive from "potlatch" due to its use in the American term "potluck dinner;" it is actually a portmanteau of "pot" and "luck." Originally, the potlatch was held by native tribes on the Pacific Northwest coast of the United States and the Canadian province of British Columbia, such as the Haida, Nuxalk, Tlingit, Tsimshian, Coast Salish, and Kwakiutl (Kwakwaka'wakw). The potlatch took the form of a ceremonial feast traditionally featuring seal meat or salmon to commemorate an important event, such as the death of a high-status person, but was expanded over time to celebrate events in the life cycle of the host family, such as the birth of a child, the start of a daughter's menstrual cycle, and even the marriage of children. Through the potlatch, hierarchical relations within and between groups were observed and reinforced through the exchange of gifts, dance performances, and other ceremonies. The host family demonstrated their wealth and prominence through giving away their possessions and thus prompting prominent participants to reciprocate when they held their own potlatches. Before the arrival of the Europeans, gifts included storable food such as dried oolichan (candlefish) or oolichan oil, canoes, and slaves among the very wealthy, but otherwise not income-generating assets such as resource rights. Some potlatch celebrations were locally centered, usually thrown by those lower in social status, while those high in the hierarchical social scheme would use the feasts in both a celebratory and diplomatic function, including neighboring tribal leaders. Some groups, such as the Kwakiutl, used the potlatch as an arena in which highly competitive contests of status took place. In some rare cases, goods were actually destroyed after being received. The conquest of America by the Europeans drastically changed the nature of the potlatch. The influx of manufactured trade goods, such as blankets and sheet copper, from explorers and settlers into the Pacific Northwest caused inflation in the potlatch in the late eighteenth and earlier nineteenth centuries, leading to an imbalance in the gifts given and received. Some people engaged in the ceremony purely to acquire the most material wealth, leading not only to a disintegration in the cultural value of the custom, but a basic breakdown in social relations and structure, causing violent and criminal acts among native groups. Even though the settlers had, at first contact, found the potlatch interesting, their misunderstanding of the ritual and the negative effects their contact had on it caused such negative consequences that potlatching was made illegal in Canada in 1884 and in the United States in the late nineteenth century, largely at the urging of missionaries and government agents who considered it wasteful, unproductive and injurious to the practitioners. Despite the ban, potlatching continued in secret for decades. Numerous tribes petitioned the government to remove the law against a custom that they saw as no worse than Christmas, when friends were feasted and gifts were exchanged. As the potlatch became less of an issue in the twentieth century, the ban was dropped, in the United States in 1934 and in Canada in 1951. A tribe well known to still practice the potlatch today is the Kwakiutl (kwakwaka'wakw). 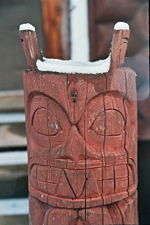 The Kwakiutl have long been studied by ethnologists and anthropologists, particularly Franz Boas. When the ceremony died out in the beginning of the twentieth century, most of the cultural artifacts were preserved by scholars. These objects helped produce not only more in-depth scholarly work on these rituals, but also encouraged some scholars to actively seek to re-establish the ritual in the surviving tribe members. Consequently, the Kwakiutl once again began the practice. Today, the potlatch is different from its original form, incorporating numerous other cultural rituals in a mosaic of preserved and modified culture specific to the Kwakiutl. The Saik'uz (Stoney Creek) First Nation built a Potlatch House in the years 1995-1996 on the shore of Nulki Lake. The potlatch house is a big log building which can hold 200-250 people, big enough for holding weddings, dances, meetings, and education courses. The Potlatch house is more than building, as it serves important ceremonial purposes including governance, economy, social status, and other spiritual practices. ↑ Peabody Museum of Archaeology and Ethnology, Gifting and Feasting in the Northwest Coastal Potlatch. Retrieved June 22, 2007. ↑ The Columbia Encyclopedia, Potlatch. Retrieved June 22, 2007. ↑ An Act further to amend "The Indian Act, 1880," S.C. 1884 (47 Vict. ), c. 27, s. 3. Adams, John W. The Gitksan Potlatch: Population Flux, Resource Ownership and Reciprocity. Toronto: Holt, Rinehart, and Winston of Canada. 1973. Barnett, Homer G. "The Nature of the Potlatch." American Anthropologist. vol. 40, no. 3, pp. 349-358. 1938. Beynon, William. Potlatch at Gitsegukla: William Beynon’s 1945 Field Notebooks. Vancouver: UBC. 2000. Bracken, Christopher The Potlatch Papers: A Colonial Case History. Chicago: University of Chicago. 1997. Dauenhauer, Nora Marks, and Dauenhauer, Richard, eds. “Haa Tuwanáagu Yís, for Healing Our Spirit: Tlingit Oratory.” Classics of Tlingit Oral Literature. vol. 2. Seattle: University of Washington. 1990. Emmons, George T., and Thornton, George. The Tlingit Indians. Seattle: University of Washington. 1991. Masco, Joseph. "'It Is a Strict Law That Bids Us Dance': Cosmologies, Colonialism, Death and Ritual Authority in the Kwakwaka'wakw Potlatch, 1849-1922." Comparative Studies in Society and History. vol. 37, no. 1, pp. 41-75. 1995. Ogden, Peter Skene. "A Fur Trader." Traits of American Indian Life and Character. San Francisco: Grabhorn. 1933. University of Washington Libraries. Oliver S. Van Olinda Photographs. This page was last modified on 27 May 2015, at 16:48.